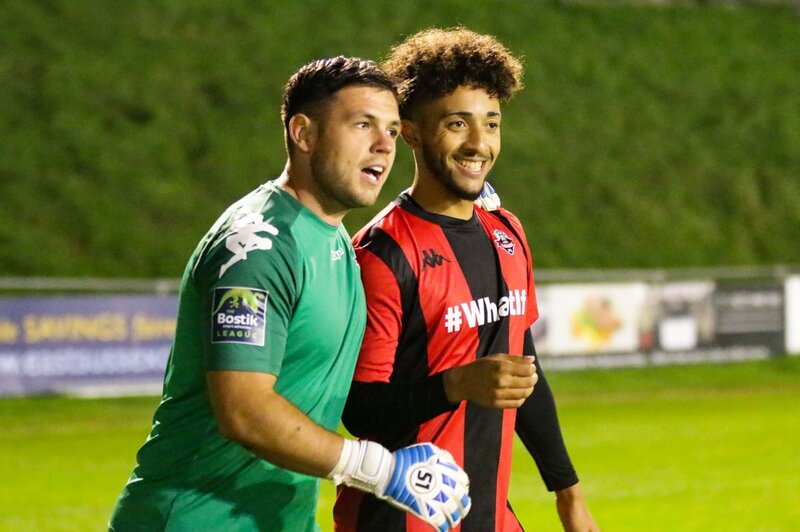 Lewis Carey was the Lewes hero with two saves in the peanlty shoot-out, as the Rooks progressed to the FA Cup second qualifying round after a 4-1 shoot-out win over Farnborough at the Pan following another entertaining cup tie that had finished 1-1 after extra-time, reports Tom Harper. Darren Freeman made four changes to the side that drew 2-2 in the first game on Saturday, with Frankie Chappell, Michael Dome-Bemwin, Charlie Copppla and Jonte Smith replacing Lloyd Cotton, Bouwe Bosma, Harry Reed and Luke Blewden in the starting line-up. At the other end, Farnborough were forced into a last minute replecement in goal as keeper James Stroud was stuck in traffic. It was an uneventful start to the game, with neither side able to create an opportunity of note during the opening stages. The first chance fell to Lewes though, who saw Coppola bravely denied by stand-in Farnborough goalkeeper CJ Fearn as he looked to convert a low Ronnie Conlon cross from close range. The visitors had proved a threat from set-pieces throughout the first game on Saturday and came close to taking the lead from one minutes later, as a dangerous corner saw a goal-bound effort blocked almost on the line before the Lewes defence were able to scramble the ball clear. The Rooks always looked dangerous when they worked the ball out wide, so it was no surprise when this led to them taking the lead after 37 minutes, as Jonte Smith, who was playing and scoring for Bermuda in the CONCACAF Nations League less than 72 hours earlier, slid in to guide another teasing Conlon cross past Fearn and into the bottom corner. Lewes started the second half brightly, and saw Conlon hit the bar from the edge of the area at the end of an impressive passing move within a minute of the restart. The Rooks were enjoying a lot of possession and were creating plenty of chances, with Blewden sending a half-volley just wide, before Smith narrowly missed the target twice in quick succession. It was therefore slightly against the run of play when the visitors equalised after 69 minutes through Connor Calcutt, who rose highest to head a dangerous left-wing cross past the previously untroubled Lewis Carey and into the far corner to level the scores. This goal galvanised the visitors, and the game became end-to-end during the remainder of the 90 minutes. Conlon missed the target from close range after a James Hammond free-kick from the right found him unmarked at the far post, before Perry Coles shot just wide from a difficult angle for Farnborough.The Rooks came close to taking the lead again minutes later, with Conlon denied by the feet of Fearn and Smith seeing his effort on the rebound deflected over the bar. The final chance of the 90 minutes fell to the visitors though, who saw Michael Fernandes cut inside from the left and send a powerful shot just over. After such a close game on Saturday and very little to separate the sides for long periods of the replay, it was perhaps no surprise that extra-time and potentially penalties would be needed to decide the winner. Lewes had the better of the chances during the first period of extra-time, with Leon Redwood seeing a dangerous free-kick from the right bounce just wide of the far post, before substitute Nico Cotton was denied by Fearn. The visitors started the second half of extra-time brightly, and narrowly missed the target with efforts from two corners just a few minutes apart. Lewes were keen to avoid penalties if they could though, and saw Smith draw another smart save from Fearn. They should have won it in the final stages of extra-time as a Redwood cross from the left fell to Smith in front of goal but with only Fearn to beat, he miscued his effort and blasted the ball horribly wide, meaning that penalties would be needed to decide who would visit Kings Langley in the second qualifying round in ten days. Lewes made a good start to the shoot-out, with Smith and Blewden converting their penalties either side of Coles scoring for the visitors. Carey then handed Lewes the advantage by saving Luke King's spot-kick, before Redwood sent Fearn the wrong way to make it three from three for the Rooks. Carey was the hero once again, making a fine save to keep out Kurtis Cumberbatch's penalty, meaning Lewes only needed to convert their fourth spot-kick to win. Cotton scored it confidently to win the shoot-out 4-1, meaning Rooks fans could celebrate an impressive victory and look ahead to the second qualifiying round. Lewes return to league action on Saturday when they welcome Enfield Town to the Pan, kick-off at 3pm. Lewes: Carey, Coppola (Blewden 28), Chappell, Freeman, Brinkhurst, Conlon (Cotton 102), Redwood, Dome-Bemwin, Smith, Hammond (Reed 109), Lawson. Unused Subs: Barclay, Gifford, Jenkins, Headland. Farnborough: Fearn, Oseni, Fagan, Appau (Simms 30), Pepera, Robertson, Fernandes (King 120), Murphy-McVey (Akanbi 106), Coles, Calcutt, Cumberbatch.